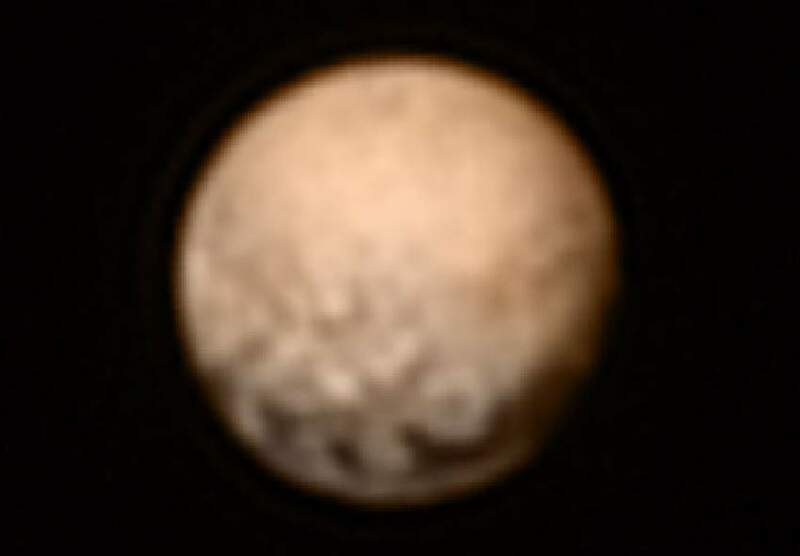 Replied by JohnONeill on topic Pluto - it's here and it's real ! Excluding other EKB objects, Pluto and Charon are the largest unexplored (known) objects in the Solar System. From the New Horizons craft, Pluto has now surpassed 10 arcsec in diameter. Maybe not seem large, but from Earth Pluto is just 0.10 arcsec across! 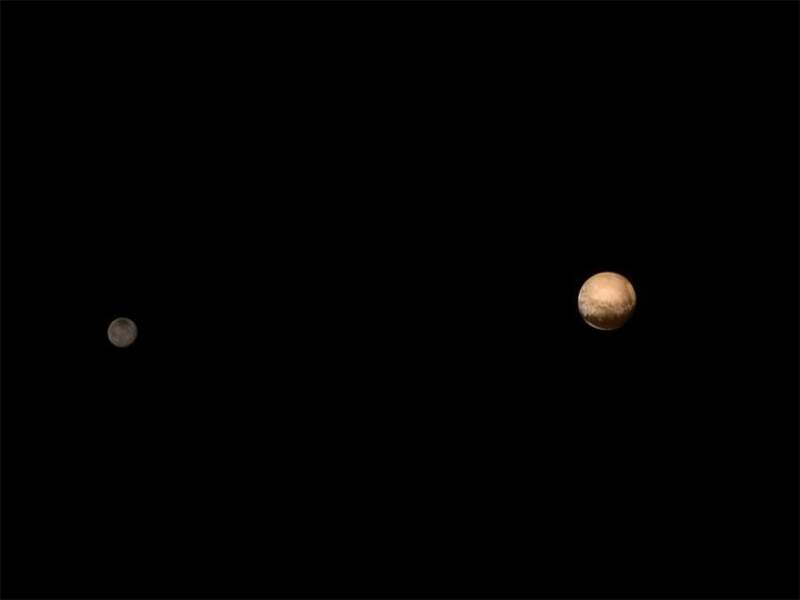 In the coming weeks Pluto and Charon will dramatically increase in size in the FOV of New Horizons cameras. Replied by mykc on topic Pluto - it's here and it's real ! The first colour movies of Pluto and Charon have been released ( www.nasa.gov/feature/pluto-and-its-moon-charon-now-in-color ). 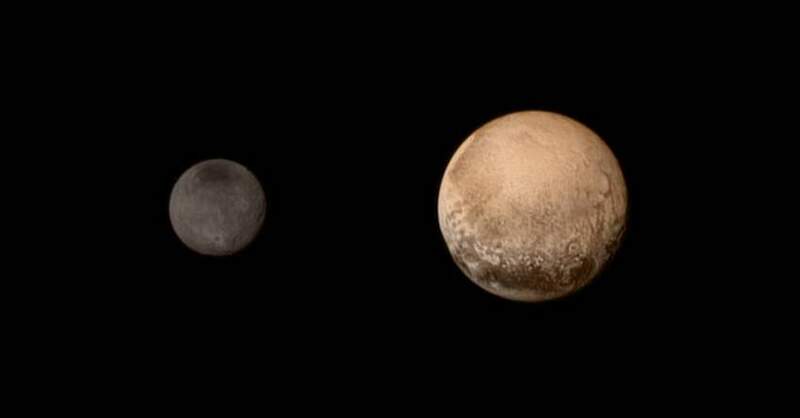 Although the resolution is very low, Pluto has a beige colour with clear variations, whereas Charon is grey. The outer (minor) planets and moons, with their many different textures and hues, have much more varied surfaces than the small rocky objects of the inner Solar System. I'm really looking forward to what will be revealed as the close fly-by approaches. Replied by Keith g on topic Pluto - it's here and it's real ! That really cool Mike, it's good to see NASA sharing it's received data with the public very quickly. I am just amazed by this world and it's moons, everyday it's just getting better. Right now we can see definite differences in Pluto's surface feature's although very low resolution, my bet is that it will look very like Neptune's moon Triton ! Hi everybody, Wow! This is just getting better from the New Horizons probe, the latest pictures from Pluto show it better than ever in colour, it could easily resemble any of Jupiters moons or indeed Neptunes Triton. 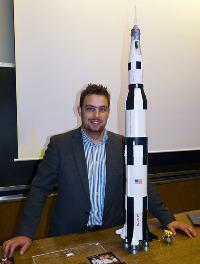 Last edit: 3 years 9 months ago by Keith g.
Pluto is still only 39" in width (and Charon 20"). But at last it's bigger than Jupiter's apparent diameter of 32". They should grow rapidly in the coming days! From Earth, Pluto is 0.10" in diameter! mysterious dark spots on Pluto, with it's reddish hue, what will still be revealed at Pluto? Hi all, this 1st clear combined shot of both Pluto and it's moon Charon was taken on Wednesday July 8th from a distance of 3.7 million miles (about 6 million kms) from both the LORRI and RALPH instruments aboard the New Horizons spacecraft. Replied by Neill on topic Pluto - it's here and it's real ! 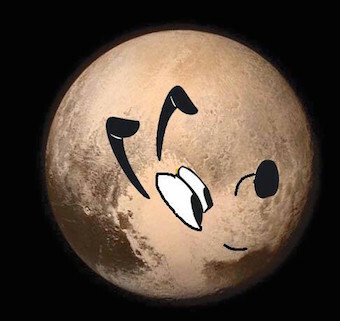 Replied by Seanie_Morris on topic Pluto - it's here and it's real ! www.nasa.gov is probably one of the best locations online for getting rapid updates on the mission today. Follow the link for LIVE NASA TV coverage later today (Irish Time). Did you know that an upward revision of Pluto's size was conducted? It is now set at 2,370km, making it the largest of the bodies known beyond Neptune. The features captured so far in the past few days have been mesmerising! Last edit: 3 years 9 months ago by Seanie_Morris. Replied by lunartic on topic Pluto - it's here and it's real ! Pluto looks magnificent, the large flat looking area to the south of the image appears like a large desert region. To the left of this region there is a great double impact crater, with one crater sitting inside its larger sibling and a rille heading away. The dark region on Charon looks a little like the Mare Orientale on the moon and there is great ray splashes from the large impact crater. If these are the opening shots then we are in for some great times as more images are released and more details are revealed. Thanks for the updates Lads, the shots released already are just spectacular, bring on tomorrow! First image after the flyby reveals unexpected new features on Pluto!! Last edit: 3 years 9 months ago by mykc. Last edit: 3 years 9 months ago by Neill. That last post should have read image it! Has anyone ever tried to locate it? I have seen Pluto a few times over the years. My first time was on the night of 24-25 April 1992 with my Coulter 13.1" (33.3 cm) Dobsonian. At that time it was on the borders of Serpens and Libra. I had no computer charts in those days! 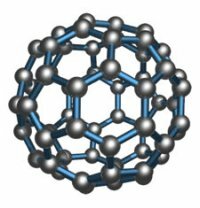 and follow the link to "Asteroids/EKB Objects". A little off theme, but you mentioning your Coulter scope takes me back, the 10" version was my first real scope, ordered from the U.S. before the internet in the 80's. Cardboard tube, push pull focusser, no finder scope. I loved that scope. After a hiatus of a few weeks, downloading of images of Pluto from the New Horizons spacecraft will resume in the next few days. Keep an eye on pluto.jhuapl.edu/soc/Pluto-Encounter/index.php for weekly updates.